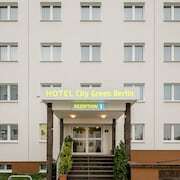 Located in Neukoelln, this hotel is 9.1 mi (14.6 km) from Alexanderplatz. Amazing staff...very helpful and they even gave us free city pass for the train and bus. Super convenience 10 min walking from the airport. Grundriss des Hauses ist gut. Der Wellnessbereich ist sehr groß. Der Aussenbereich ist großzügig. Where to find Gross Koeris hotels near an airport? Where can I find hotels in Gross Koeris that are near tourist attractions? Visitors to Gross Koeris should think about booking a room as soon as possible, as they won't find a wide range of accommodation options close to the town center. 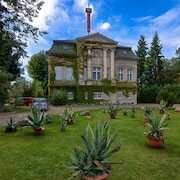 If you want to stay that is not far from the center of Gross Koeris, the Hotel Seeschloesschen may be a good place to check out. 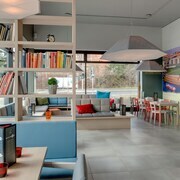 The Apart - West im Hotel Esprit can be found 35 kilometres (21 miles) from the main part of Gross Koeris. Or, alternatively, the Van der Valk Hotel Berlin Brandenburg is 25 kilometres (14 miles) away. 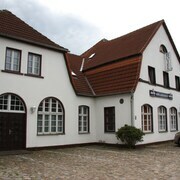 The Landhaus zur alten Gärtnerei and the Holiday Inn Berlin Airport - Conference Centre are some other Expedia-listed accommodation options in Gross Koeris. 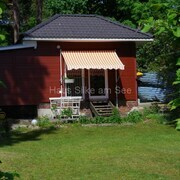 The nearest places to spend the night in Spreewald are Cottbus and Mittenwalde. Cottbus is 65 kilometres (39 miles) to the southeast of Gross Koeris, while Mittenwalde is 14 kilometres (8 miles) to the northwest. Hotels and apartments in Cottbus are the Radisson Blu Hotel, Cottbus and Lindner Congress Hotel Cottbus. 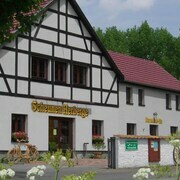 The Waldschlösschen and Alter Krug Kallinchen are the hotels in Mittenwalde. Before you head home, why not spend an afternoon rubbing shoulders and cheering along with local sports fans at a local match. Olympic Stadium is 50 kilometres (31 miles) to the northwest of Gross Koeris. Those sports fans wanting to find accommodation close to the stadium can select from the PATRICK HELLMANN SCHLOSSHOTEL or the Novum Hotel Kronprinz Berlin. Schoenefeld Airport is a convenient airport, and is 30 kilometres (17 miles) away from Gross Koeris. Conveniently located hotels include InterCityHotel Berlin-Brandenburg Airport and Airporthotel Berlin Adlershof. What are the most popular Gross Koeris hotels? Are there hotels in other cities near Gross Koeris? What other types of accommodations are available in Gross Koeris? Explore Gross Koeris with Expedia.ca’s Travel Guides to find the best flights, cars, holiday packages and more!